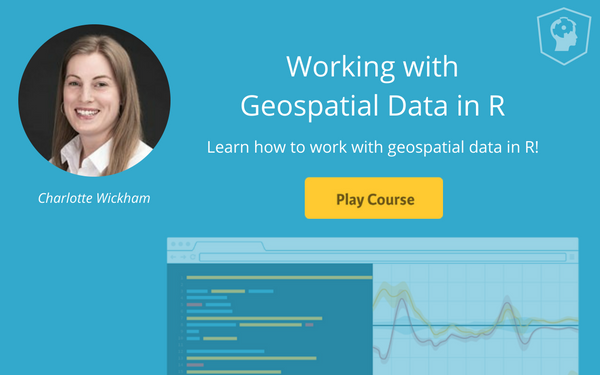 Learn about our newest course, Working with Geospatial Data in R with Charlotte Wickham! Where should you buy a house to get the most value for your money? Your first step might be to make a map, but spatial data can be intimidating in R because of the complicated objects it often lives in. Our new course Working with Geospatial Data in R taught by Charlotte Wickham will introduce you to spatial data by starting with objects you already know about, data frames, before introducing you to the special objects from the sp and raster packages used to represent spatial data in R. You'll learn to read, explore, and manipulate these objects with the big payoff of being able to use the tmap package to make maps. By the end of the course, you will have made maps of property sales in a small town, populations of the countries of the world, the distribution of people in the North East of the USA, and median income in the neighborhoods of New York City. Working with Geospatial Data in R features 58 interactive exercises that combine high-quality video, in-browser coding, and gamification for an engaging learning experience that will develop your ability to work with geospatial data in R! The first chapter of this course you'll dive in by displaying some spatial data -- property sales in a small US town -- using ggplot2 and we'll introduce you to the ggmap package as a quick way to add spatial context to your plots. We'll talk about what makes spatial data special and introduce you to the common types of spatial data we'll be working with throughout the course. [Start First Chapter For Free] In the next chapter we'll introduce you to the spatial object classes provided by the sp package, particularly for point and polygon data. You'll learn how to explore and subset these objects by exploring a world map. The reward for learning about these object classes: we'll show you the package tmap which requires spatial objects as input, but makes creating maps really easy! You'll finish up by making a map of the world's population. The third chapter continues with the theme of population from Chapter 2, but you'll look at some much finer detail datasets, both spatially and demographically. In the second half of the chapter you'll learn about color -- an essential part of any visual display, but especially important for maps. In the final chapter of this course, you'll follow the creation of a visualization from raw spatial data files to adding a credit to a map. Along the way, you'll learn how to read spatial data into R, more about projections and coordinate reference systems, how to add additional data to a spatial object, and some tips for polishing your maps. So, what are you waiting for?